The annual “Prudential-Good Essay, Good Writing Contest” is being organized in Ho Chi Minh City from September 15 to October 23. Accordingly, district-level contests will be held at secondary high schools in districts throughout the city from September 16 to October 6. Every district will choose six outstanding students scoring the highest marks at the city-level contests. The awards ceremony of the contest will take place on October 23 in Ho Chi Minh City. 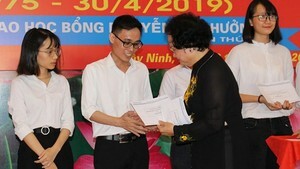 “Prudential-Good Essay, Good Writing Contest” is organized each year by Life insurer Prudential Vietnam and the Sai Gon Giai Phong Newspaper. The contest is also supported by the municipal department of education and training and held annually for students of secondary high schools in Ho Chi Minh City. The contest aims to encourage literature, reading and good essay writing amongst students, encouraging them to bring out their sensitivity and creativity of expression.